It’s our nature to help. David Ripp joined the Port in January 2008 as Chief Executive Officer. He brings to The Port over 24-years of Port leadership experience. 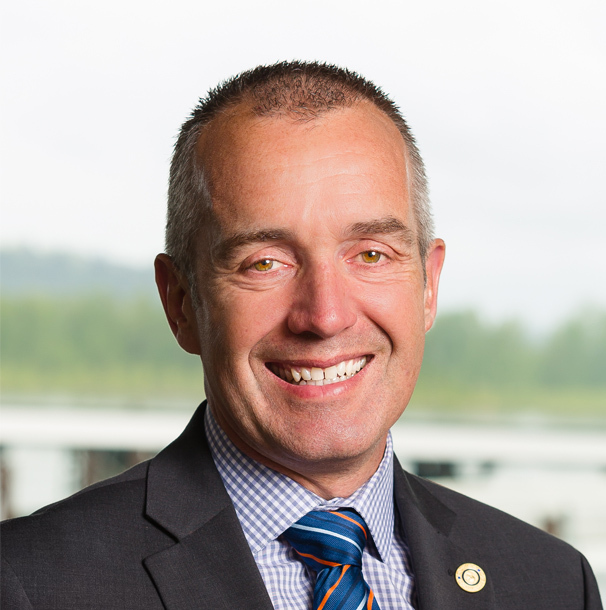 Mr. Ripp is responsible for the strategic direction for the Port of Camas-Washougal, as well as creating a vision of success. Yvette joined the Port in April 2016 and works directly with the Commission and Chief Executive Officer. She is the public records officer and responsible for website updates, advertising, press releases, public notices, writing the Port Reports and annual Community Report. Yvette attends Commission meetings, prepares the minutes, and is staff support for the Parkersville Advisory Committee. Kim joined the Port in April 2007. Her education and 25+ years of experience in public service are assets to the Port. As Director of Operations, Kim is responsible for the growth and profitability of The Port. Jen joined the Port in June 2006. As Accountant, she handles accounts receivable, payroll and other related duties. In 2008, she took on the additional responsibility of Human Resources and currently leads the Port’s Safety Team. Jen’s high standards and attention to detail – critical in these important roles – serve the Port well. Kyle joined the Port team in August 2015, in the position of Accounts Payable, IT support and managing social media. Kyle graduated from WSU, with a minor in Communications and a major in Digital Technology and Culture. With 8+ years of customer service as well, he is a valuable addition to our team. Krista joined the Port in October of 2017. She has over 10 years of experience in accounting, payroll, AR and AP. The Central Washington University graduate also has 15+ years of customer service and manages all payroll functions, supports the Finance Director, assists with marina and airport leases, and other office duties. Sadie joined the Port team in January 2018. With over 14 years of event planning and customer service experience, the Washington State University graduate brings a breadth of knowledge, personalized service and enthusiasm to the position. Sadie handles event planning, moorage and hangar leases, front desk, and other office duties. Jeramy Wilcox joined the Port in October 2008, starting in the Maintenance Dept. and was soon moved to the administrative side as the Project Manager, now in the role of Facilities Manager Jeramy is responsible for the day to day Maintenance and operations of all Ports Assets to include Grove Field Airport, 350 slip Marina, Industrial Park, Levee system as well as all outdoor Park areas. Mark joined the Port in June of 2017 as the Project Manager. Mark’s extensive construction experience and over 13 years of public service make him a valuable asset to the Port team. His responsibilities include permitting, implementation and delivery of capital projects, contract policy, budgeting, project estimating and coordinating major aspects of construction project management. Debra joined the Port in 2001 and has continued to grow professionally within the organization with her experience and attention to detail. Debra is the Contract Specialist for the Port and manages all contracts and their supporting documentation for all state and federal requirements. Eric joined the Port in November 2010 in the position of Maintenance Assistant, bringing a background in general construction and HVAC and he currently holds the position of Maintenance Supervisor. In 2013, Eric was given the added responsibility of overseeing and maintaining all heating/cooling services in Port-owned structures. Based at Grove Field, Eric is an invaluable team player. Mark joined the Port in 2005, in the role of Maintenance Assistant. Promoted to Harbormaster in 2007, he works in the Marina area, checking the docks and boats, overseeing the trailer parking area, responding to tenants’ needs, and maintaining a safe and secure marina for the public to enjoy. Doris joined the Port in 1999. She is directly responsible for the manicured lawns, the seasonal flowers, and the tidy look of the Port’s property – at the Marina, Parker’s Landing Historical Park, the Airport, the Industrial Park, Capt. William Clark Park, and Steigerwald Commerce Center. Doris’ skills have helped make the Port a destination spot for many in the community. Matt joined the Port in May of 2013 in a permanent part-time maintenance position and moved into full-time as of January 1, 2015. He assists the Harbormaster in the Marina checking the docks and boats and responding to tenants’ needs. Matt also offers his expertise as an arborist and assists with all areas of maintenance. Travis has been a familiar face on the launch ramp for the last dozen years. Hired full-time in January 2016, he joins the maintenance staff in a supporting role performing light maintenance. Travis is based in the Industrial Park. His background in security at local schools and experience in dealing with the public are valuable assets for the job. Dennis joined the Port in January of 2018. He has vast experience with commercial and residential construction along with general contracting. His role at the Port is performing maintenance on Port properties such as buildings, marina, airport, roads, parking lots, etc. He is a valuable asset to the team.